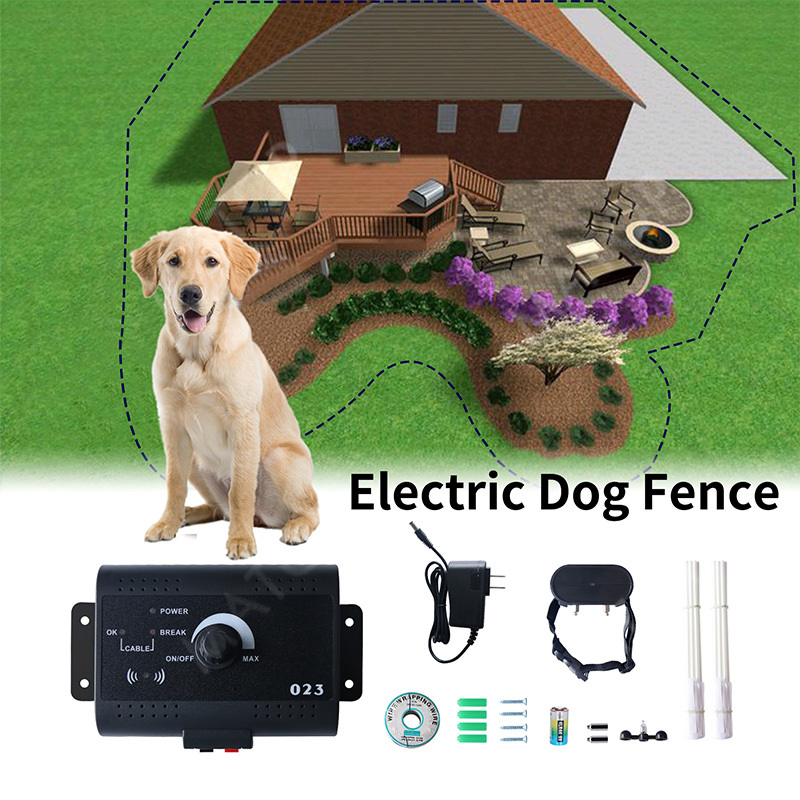 Safety Wireless Electric Fence For Dog Training Collars .Electronic Training Collar Pet Barrier Safe Containment Fencing System. 1. Coverage Area Is 100% Customizable Up to 1.2 Acres 5,000 Sq. Ft. 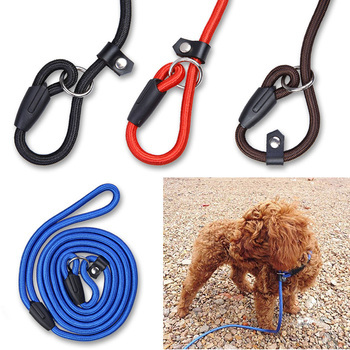 Simply Bury the Wire (Up To 1000 Feet Long) Around the Designated Area Along with the Included Perimeter Flags to Begin Training Your Dog. 2. Pet Collar Fits Dogs 8 Pounds and Up with Neck Sizes from 8 to 20 Inches (Small/Medium/Large/Extra Large Dogs). Each collar will vary slightly in sensitivity and the difference in range could be 6-12 inches but it will not affect how the system works. Perform the “Short Loop Test” to determine if the transmitter needs to be replaced or if the boundary wire is broken. 3. 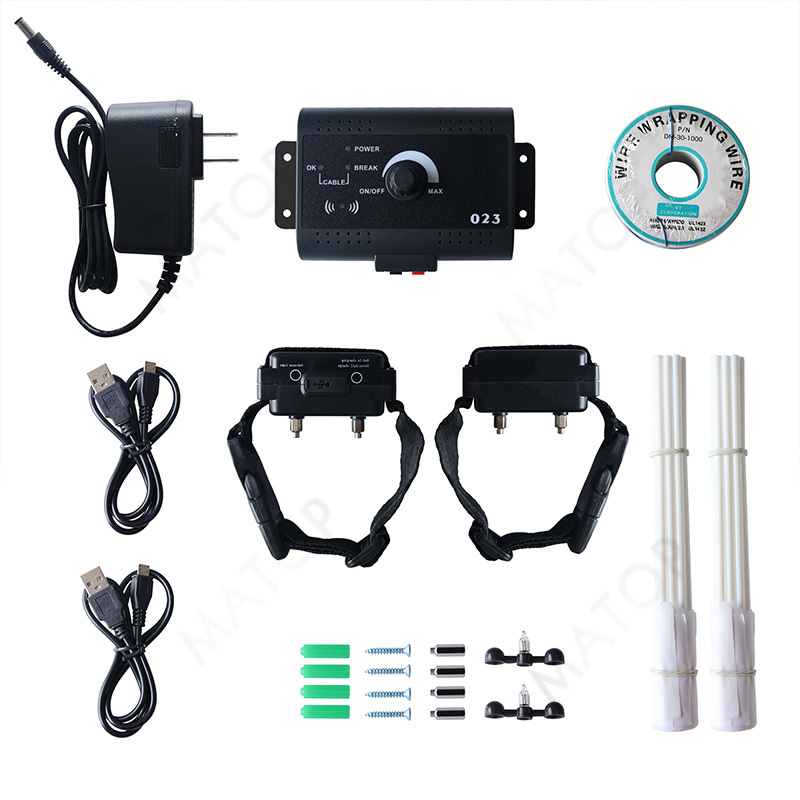 Multiple Collar System Where 1 Transmitter Can Pair Up With Infinite Number of Receiver Collars. 4. 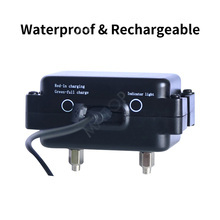 Collar Receiver is Water Resistant and Rain proof. Receiver Delivers Safe Static Correction Shock Stimulation When Pet Strays Into Warning Zone. 1.Progressive Tone Stimulus- A warning tone will be issued first, then a shock stimulus if your dog continues to move closer to the boundary. 2.Pulsed Proportional Stimulus – The closer your pet gets to the boundary, the more intense the shock. 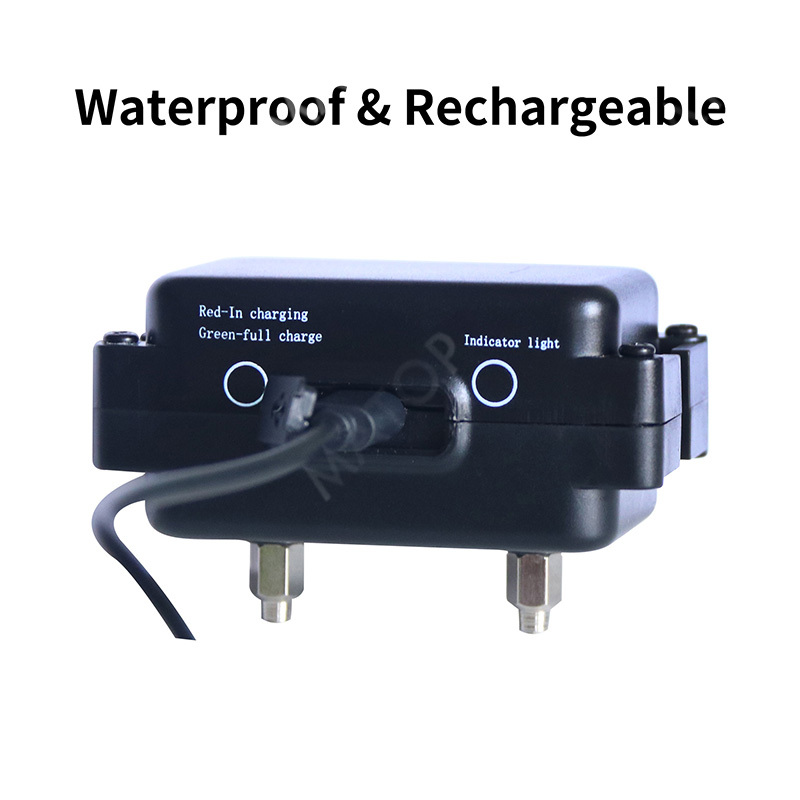 3.Power Boost Switch -The width of the warning can be adjusted by field width adjustment knob in the transmitter. 4.Audio Wire Break Alarm- The system’s control center has an audible alarm to alert you if it senses a break in the wire or if the boundary system is not functioning correctly. 5.Speed Detect Anti-Run Through- The faster your dog is moving, the quicker the higher level of intensity is issued. 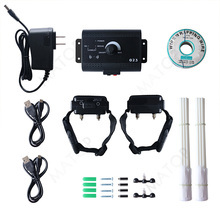 6.Visual Wire Break Alarm- The system’s control center will light alsoup if it senses a break in the wire. 8.Low Battery Indicator – When the light on the collar is green, it is working properly. 9.Red it means time to replace the battery. 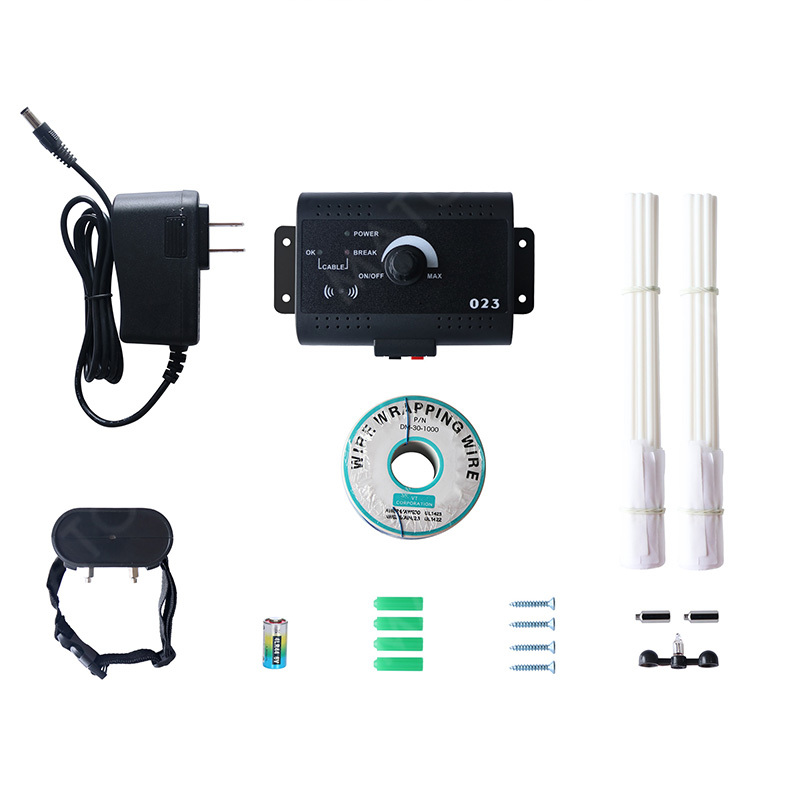 1) Wall-mounted transmitter: Transmitter is the central controller to whole electronic system. Make sure the wire is set to a loop. 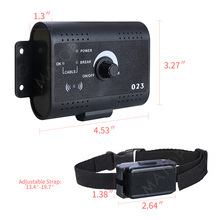 2) The receiver collar: Receiver (collar) will make a warning beep firstly and then continuous stimulation if your dog attempts to approach wire boundary. *Design your containment area and calculate the amount of wire needed. *Lay out the perimeter wire. 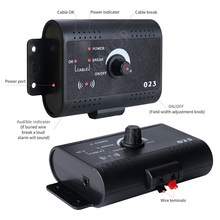 *Connect the perimeter wire to the wall transmitter. *Verify transmitter is functioning without problem. *Set up the receiver and then, test the containment system and adjust the field width. *Install the boundary wire and training flags. *Fit collars to your dogs and train your dogs. Please take a few minutes to read the instruction manual prior to your first use.It is very important to read the manual before using this system. 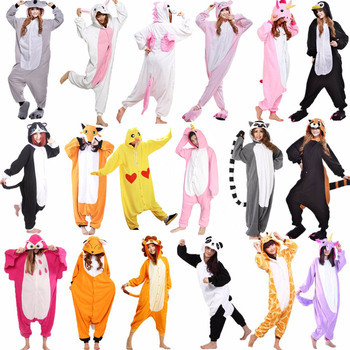 1.The collar is not fully waterproof, pleas stay away from water like swimming when used;. 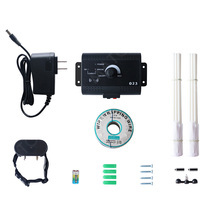 2.As this product is a wireless transmitting apparatus, you must NOT use the remote control system in places like petrol stations or hospitals where mobile phones are prohibited. 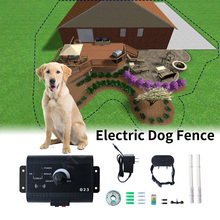 *The electronic dog collar is intended only for use on dogs. * A low battery may cause intermittent operation. DO NOT USE if you suspect a low battery. *Allow your dog to get used to the collar before you begin training. You want your dog to accept the collar as part of a routine, not to associate the collar with correction. 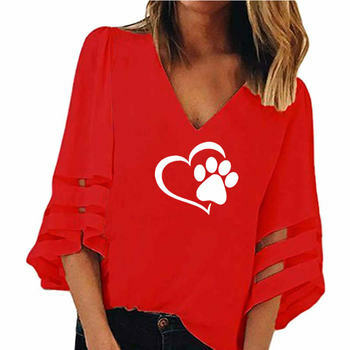 *DO NOT leave the collar on your dog for more than 12 hours per day. *NEVER perform set-up procedures when the collar is on your dog. *An electronic collar should only be used under close supervision by the dog’s owner. • 4 * screws;• 1 * User’s manual.